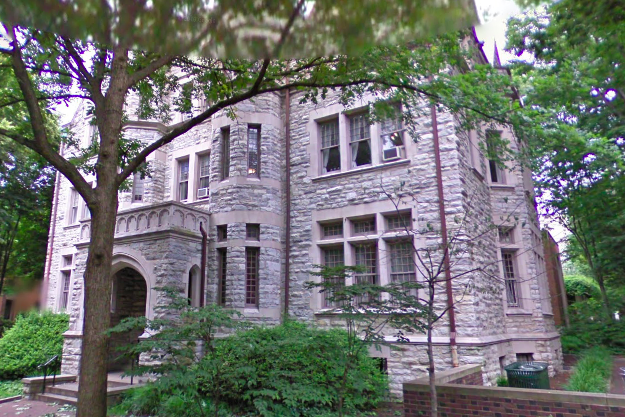 Chapter house of Phi Upsilon, also known as Castle at the University of Pennsylvania. A recent graduate of the University of Pennsylvania is seeking more than $150,000 in damages from a popular fraternity after she suffered a serious burn caused by a giant flaming marshmallow. The civil suit was filed in federal court last week by 2018 nursing graduate Jessica Davis, who claims she was injured during a Halloween party hosted by Phi Upsilon, known around campus as Castle, according to The Daily Pennsylvanian. On October 27 last year, Davis attended the fraternity's off-campus party, "Magic Gardens Halloween," at 5126 Warren St., just off Lancaster Avenue in West Philadelphia. In advance of the event, the fraternity sold $60 bracelets providing access to the party, which included unlimited drinks, free BBQ, fire pits, live DJs, fire performers and pirates, among other highlights, according to the lawsuit. Legal documents show Castle took in $60,000 for the event and hired only two security guards to watch the doors, as required by the university. The guards allegedly never entered during the party hours from 10 p.m. to 2 a.m.
Davis attended the party wearing an open back shirt. At one point, she stood nearby a large firepit where the fraternity had provided sticks and marshmallows for guests to roast. The firepit was unsupervised, according to the lawsuit. As Davis stood with her back facing the firepit, another guest who was "visibly intoxicated" roasted a giant marshmallow, the lawsuit claims. When the marshmallow caught fire, the intoxicated partygoer allegedly shook her stick to extinguish the flames, but the marshmallow flew from the stick, landing on Davis' back and adhering to her skin. Davis suffered a significant burn to her back and permanent scarring, according to the lawsuit. Photos of the injury enclosed in the suit show a large burn on Davis' lower back. The negligence complaint names the fraternity, its national office, the venue landlord and three fraternity members as defendants. Davis is represented by personal injury firm Morgan and Morgan of Philadelphia.